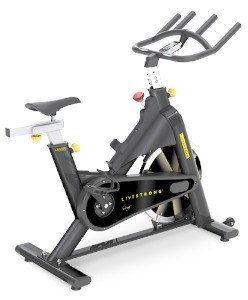 The Livestrong LS9.9IC indoor cycle provides for intensive workouts on its rugged frame, and extensive programming options with a training DVD that ships with every purchase. The on-sole computer and three LED windows show RPM, time, distance, speed/minute, pulse, and calories. The console is battery operated. The Livestrong LS9.9IC features a high-tensile, corrosion-resistant frame, forging steel cranks, a hyper-smooth Kevlar® chain wheel system, 40-lb (20 kg) flywheel, multi-position handlebar, and an Air Fit road-style saddle with both vertical and horizontal adjustment. The resistance levels (pedaling degree of difficulty) is regulated in increments by use of the resistance knob. 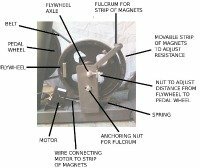 The indoor cycle does not have a free moving flywheel (wheel), which means the pedals move together with the flywheel, and there is no “coasting” with a direct drive cycle. To reduce speed or stop while pedaling, use the micro-adjust knob on the friction brake. There is also a red emergency stop break knob. The Livestrong LS9.9IC ships with an exercise DVD that features 54 diverse workouts for all training levels. It also includes instruction on proper positioning and form changes to help you maximize results. 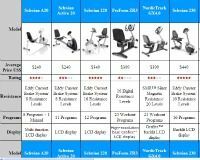 There aren’t many exercise bike reviews on this model unfortunately so it is hard to say where this model goes above and beyond similar priced spin bikes offered by competitors. In any case, reviewers report they are completely satisfied with the performance of their Livestrong indoor cycle. As you can see from the list of specs, there are several things to like about the LS9.9IC, especially the heavy flywheel, micro adjust resistance, and full adjustability. If you are an avid outdoor cyclist needing an indoor trainer, or you are looking for a high quality spin bike, this model compares favorably to the outstanding Spinner Pro and Spinner Velo made by Star Trac for around the same price. For $999, the Livestrong LS9.9IC indoor cycle is another Good Buy.